Best Value Mechanical Engineering Colleges in the U.S. Achieve your Mechanical Engineering degree by finding a quality option you can afford. Explore best value schools below. U.S. colleges and universities saw 32,845 Mechanical Engineering individuals graduate with bachelor degrees in 2017. The average salary of a Mechanical Engineering grad is $57,795 in their early career and $96,360 in mid-career. However, students report earning anywhere from $45,090 to $69,216 in their early career, and $69,574 to $153,972 in mid-career, depending on the program. In order to get the most from your degree, find a college that offers great quality for a fair price. College Factual's "Best for the Money" ranking takes into account both the positive outcomes of students and the total cost of a degree. 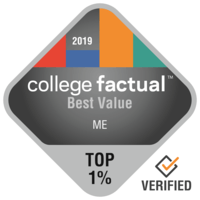 To learn more about the methodology behind this ranking see this article about our best value colleges by major methodology. If you want the very best training available in Mechanical Engineering you simply can't do better than Cooper Union for the Advancement of Science and Art. This is a fairly common subject of study at Cooper Union, with 15.0% of undergraduate students signed up for it. The setting in a major city is great for scholars trying to find adequate opportunities for social networking, adventure, and exploration. Every additional year of college causes students to increase their debt, so Cooper Union's strong 75.2% graduation rate is definitely a plus. International students coming from approximately 1 different countries are enrolled at this school. Interested in knowing more about Cooper Union for the Advancement of Science and Art's campus? Have a virtual tour. South Dakota School of Mines and Technology is one of the finest schools in the country for Mechanical Engineering. At South Dakota School of Mines and Technology, me learners enjoy the advantage of a really focused curriculum. The location in a significant city is wonderful for students seeking ample chances for networking, experience, and discovery. You may want to study hard for your SAT; the typical score of applicants to South Dakota School of Mines and Technology is 1,165. You might want to invest in an ACT prep course before you take the test since the typical ACT score is 26. Check out all of South Dakota School of Mines and Technology's rankings to learn more. Every student pursuing a degree in Mechanical Engineering has to check out Brigham Young University - Provo. Brigham Young University - Provo is among the largest schools in Utah. Brigham Young University - Provo's rate of student loan default of 1.6% is far below the national average of 7.0%. With 70.1% of the professors being full time, students are sure to get plenty of face time with educators. The scorecard will give you a good review of BYU. It's hard to find a better school than New Mexico Institute of Mining and Technology if you want to study Mechanical Engineering. Students who graduate from the me program earn an average of $57,658 for their early career and $98,019 in their mid career. Students who enjoy a more slow-paced life will appreciate New Mexico Institute of Mining and Technology's location in the small town of Socorro, New Mexico. This school is well-known for the support of military personnel and is the 726 best in the nation for veterans. Even if you're not from New Mexico, you won't feel as if you're the odd one out at this school. About 11.5% of students are from out-of-state. Videos from New Mexico Tech could be a great way to learn more about school. University of Florida is among your best bets if you're planning on studying Mechanical Engineering. Grads of the me program state that they receive average early career wages of me and mid-career wages of $108,149. Located in Gainesville, Florida, this school is a good choice for students who enjoy the thrill of a significant city. About 82.0% of the instructors at U of F have full-time hours, which means they should have plenty of time to give attention to students in their class. This school is a great value for the money for students in Florida. Go on a virtual tour to learn more about U of F.
Missouri University of Science and Technology is a wonderful choice for students pursuing a Mechanical Engineering degree. Graduates of the me program make around $60,196 in their early career salary and $95,918 in their mid-career salary. Rolla, Missouri provides a whimsical small-town ambiance for young people to learn in. With 77.4% of the teachers working full time, students are sure to get plenty of interaction with professors. Around 3.0% of Missouri University of Science and Technology applicants submit their SAT scores, which average around 1,281. Check out some school videos to learn more about what being on campus is like. It's hard to beat SUNY Maritime College if you wish to pursue Mechanical Engineering as a major. At SUNY Maritime College, 14.4% of undergraduates major in me. Placed in Throggs Neck, New York, this college is a strong final choice for students who enjoy the buzz of a large city. Considering 25.9% of SUNY Maritime's campus resides outside New York, you are going to have lots of chances to befriend students from all over the country. Freshmen are not required to live on-campus at SUNY Maritime College. Go deeper and discover how well SUNY Maritime ranks in other categories. Any student pursuing a degree in Mechanical Engineering needs to look into Texas Tech University. Graduates of the me program report average early career earnings of me and mid-career earnings of $106,300. Based in Lubbock, Texas, this university is a good choice for students who prosper in a city atmosphere. Score more than 24 on the ACT? That's above the average applicant score, so you have a good chance of getting in. Because of the school's fantastic four-year graduation rate of 34.1%, college students usually accumulate less debt compared to what they would at other institutions. For more info, check out the college scorecard. Purdue University - Main Campus is among your best bets if you want to study Mechanical Engineering. Grads of the me program state that they receive average early career earnings of me and mid-career earnings of $99,819. Looking for a big school? This institution has more than 20,000 students on campus. Sports lovers will like cheering on the university's top-ranked men's basketball team as they perform at home and on the road. Campus safety a concern? You are going to be happy to find out that this school is known for a low crime rate. Go on a virtual tour to learn more about Purdue. Oklahoma State University - Main Campus is among your best bets if you're planning on studying Mechanical Engineering. Soon after getting their bachelor's degree, me students typically make about $62,546 in the first five years of their career. Students who enjoy a more slow-paced life will appreciate Oklahoma State University - Main Campus' location in the small town of Stillwater, Oklahoma. Around 87.8% of the educators at Oklahoma State University - Main Campus are full-time and get normal office hours, so they should be more accessible to students. Approximately 38.8% of students complete their degree on time at Oklahoma State University - Main Campus, which is much higher than the national average of 37.0%. Obtain all the crucial facts on Oklahoma State by checking out their scorecard.